A few years ago, during the month of February I was visiting a friend’s garden in Suffolk and encountered a well-flowered specimen shrub of Prunus mume ‘Beni-chidori’. Perhaps it was the striking deep, purplish-pink flowers that caught my eye in the first instance, but the sensuous waft of fragrance that met my nose was a real highlight. Due to the exotic nature of such a lovely winter/spring-flowering shrub, I asked about its hardiness. “No issues” was the reply. The species is native to Western China. An article in the Daily Telegraph by Ursula Buchan highlighted the need for careful choice of position relative to early-spring flowering shrubs, such as the above-mentioned. She wrote “the trick with plants that flower in late winter and early spring is to find them a sheltered spot where the flowers are not seared by cold easterly gales in March (something that I am all too well aware of, here in E.Scotland), nor subjected to rapid thawing by the sun after a night’s frost”. I totally agree and what sensible advice. Not always easy to locate such a spot for our favourite shrubs that fall into this category, but well worth keeping in mind. 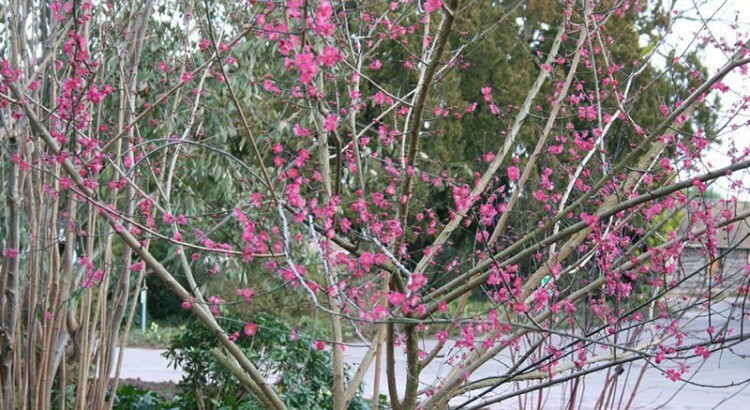 The Prunus cultivar under the spotlight is a cultivated form of the Japanese apricot (the species P.mume was introduced to Japan and further developed there) – hence the striking colour of flowers. I personally rather like the subtle charm of the single flowers and appreciate the modest stature of its habit, forming a small, upright tree/shrub to 3m (10ft) tall after some 10 to 12 years. The strikingly beautiful flowers are sweetly scented of almonds and typically appear in late February at the same time as many spring-flowering bulbs which can form a pleasing contrast at the base of the shrubby stems. Position it in a similar spot to subjects such as a Chimonanthus praecox so that you do not need to step far into a border to enjoy the fragrance of the flowers.